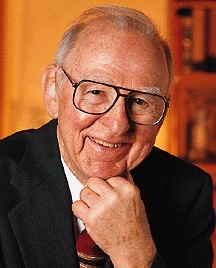 Edwin Gerhard Krebs was born on June 6, 1918 in Lansing, Iowa. He was the son of a Presbyterian minister, William Carl Krebs, and Louise Helen (Stegman) Krebs, who was a schoolteacher before she married. Krebs' family moved many times during his youth as his father took different ministry positions. Krebs' father died when he was sixteen and a freshman in high school. After his father's death the family moved to Urbana, Illinois, where Krebs attended the University of Illinois majoring in chemistry. He earned a scholarship to Washington University in St. Louis, Missouri, where he studied medicine. After completing a 18 month residency and serving as a medical officer in the U.S. Navy, Krebs was unable to find a clinical position. Instead he took a postdoctoral research position working in the laboratory of Carl and Gerty Cori at Washington University. In 1948 Krebs was appointed assistant professor of biochemistry at the University of Washington, where he remained until 1968. In 1968 he moved to the University of California Davis, where he served as the founding chairman of the department of biological chemistry. Krebs returned to the University of Washington in 1977. Krebs' research involved enzymes, the protein molecules that catalyze biochemical reactions. While at the University of Washington, Krebs worked with Edmond Fisher and the pair discovered the reversible phosphorylation of glycogen phosphorylase which serves to activate the enzyme. Glycogen phosphorylase is the enzyme that removes monosacharides from glycogen (the polysacharide used to store glucose for future use) so that they can be broken down into energy. Glycogen phosphorylase exists in two forms A and B. The Cori's had found that form B is inactive unless it is in the presence of adenosine monophosphate (AMP) and that form A is active without AMP. They also knew from the experiments of the Cori's that the active A form degrades into the inactive B form. Krebs and Fischer discovered that the B form is reversibly phosphorylated (phosphate is added to the protein molecule) converting it into the A form, which causes it to be activated so that it can break down glycogen. This was the first discovery of reversible phosphorylation which is a ubiquitous mechanism that serves as a means of activating many enzymes and transducing biochemical signals. For their discovery of the regulation of glycogen phosphorylase by phosphorylzation Krebs and Fischer were awarded the 1992 Nobel Prize in medicine and physiology. Krebs died on December 9, 2009. Krebs, Edwin G.; "Nobel Autobiography"
prof premraj pushpakaran writes -- 2018 marks the 100th birth year of Edwin Gerhard Krebs!! !